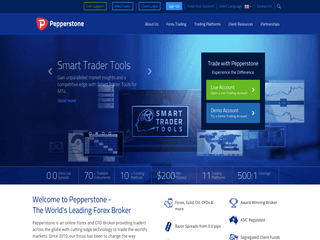 Launched back in 2010, Pepperstone has quickly gained ground to turn itself into one of the most gigantic CFD and Forex brokerages worldwide. The Pepperstone Group of companies is an execution-only Forex and CFD brokerage which offers trading solutions that are simplistic enough for newbies to the Forex niche, yet sophisticated enough for even the most proficient Forex investors. Pepperstone is adept at helping institutional and retail investors use Forex and other instruments as a part of their investment aims. It always strives to provide the most top-notch platforms for trading with an access to low-cost pricing, quick execution, trustworthy trading infrastructure, and excellent client service. The company grants direct access to multiple liquidity destinations on the forex markets, excluding the regular obstacles of a dealing desk. Pepperstone was incepted in an effort to circumvent the frustrating delays in trading and it does so thanks to the help of low-latency execution and low-cost spreads. The Australian Securities and Investment Commission (ASIC) and the Financial Conduct Authority (FCA) are the regulatory agencies charged with authorising Pepperstone. Pepperstone is equipped with an excellent choice of trading accounts, including a Sharia-compliant Islamic account. The classic account type of Pepperstone grants access to competitive liquidity with no commissions as well as Interbank spreads from 1.0 pips. The features of the Razor Account at Pepperstone include a leverage of 500:1, hedging, EAs, and scalping, as well as a wide range of base currencies. The minimum amount to launch a Razor Account is $200 AUD or an equivalent. For every 100k traded, there is an ECN commission of $3.5 AUD. The max trade size is 100 lots while the min trade size is 0.01 lots. The Islamic Account’s characteristics comprise of zero commissions, no swaps, and an average spread of EUR/USD of 1.0-1.2 pips. The minimum deposit sum is $200 AUD, and scalping, hedging, and EAs are all allowed. For much higher volumes and institutional investors, Pepperstone has crafted the Active Traders programme that features VPS hosting services, segregated tripartite account, advanced reporting, and custom solutions, such as FX GUI and API. A whopping selection of 11 trading platforms surprises new investors at Pepperstone. This array includes cTrader and MT4. However, bear in mind that cTrader is only available for Windows and cTrader Web while MetaTrader 4 is also accessible via a MAC device. Both platforms also offer tablet and smart phone version, are completely gratis, and provide for automated trading via EAs. In addition, they also include customisable charting and indicators, the handy copy/social trading functionality, and strategy back testing. MetaTrader 4 makes available all trading instruments while cTrader does not offer the XNG/USD pair. However, cTrader permits traders to use detachable charts for multiple monitors, and offers adjustable time sessions and advanced stop loss/take profit levels. For MetaTrader 4 users, there are the convenient Percent Allocation Management Module (PAMM) and Multi Account Manager (MAM) features that are specifically crafted for money managers. The benefits and features of these modules comprise of an infinite number of client accounts, client allocations as low as 0.01 lots (or 1,000 currency units), Expert Advisors, and monitoring performance and commissions in real time. Stringently overseen by the Financial Conduct Authority and the Australian Securities and Investment Commission, Pepperstone punches above its rivals’ security weight. The Forex enterprise of Pepperstone is independently audited by the worldwide accounting company Ernst & Young; the London’s Lloyds provides for a Professional Indemnity Insurance; and reputable Australian banks maintain the clients’ cash. All these factors contribute to the steady breathing of Pepperstone’s avid investors. Packing an even mightier security punch, Pepperstone keeps traders’ funds on trust in segregated accounts which are completely isolated from the own cash of the company – compliant with the money rules of ASIC and FCA. What’s even more impressive is the safeguard offered by the Financial Services Compensation Scheme of the United Kingdom serving as a last resort for firms that are FCA-authorised and provide financial services. This protection may cover up to £50,000 per firm or per person in the event of an insolvency or a default. While security is of utmost importance for Pepperstone, another thing of paramount importance is the professional attentiveness with which the company’s customer support team handles client queries and issues. It boasts a 24-hour phone and online support as well as a live help. The company has its centre of operations in Melbourne, Australia, but it also possesses branches in London, Bangkok, Dallas, and Shanghai. Pepperstone’s state-of-the-art website is accessible in English, German, Thai, French, Italian, Indonesian, Khmer, Arabic, Vietnamese, Korean, Chinese, Russian, and Spanish. Pepperstone does not take any internal fees for withdrawing or depositing. Nevertheless, bear in mind that payments from and to international banks may require fees for transfers from either party. These fees should be covered by the customer. Depositing at Pepperstone is possible via VISA, PayPal, MasterCard, POLi, China UnionPay, Skrill, BPay, Qiwi, NETELLER, Broker to Broker, Fasapay, and Bank Wire. Withdrawals are executed using the same methods and those through bank wires necessitate 3-5 business days. Pepperstone’s base currencies for opening accounts and depositing funds in them include Australian dollars (AUD), New Zealand dollars (NZD), United States dollars (USD), Canadian dollars (CAD), Japanese yens (JPY), Euros (EUR), Hong Kong dollars (HKD), British pounds (GBP), Swiss francs (CHF), and Singapore dollars (SGD). One of Pepperstone’s best programmes is the refer-a-friend promotion that aims to reward clients who woo their friends and family into trading at Pepperstone. In this regard, the growth of the Forex corporation is largely thanks to these referrals that come from existing customers. For every new trader at the company who happens to fund his or her account with more and $1,000 AUD (or an equivalent sum) and does trade at least 5 standard forex lots, Pepperstone will deposit $100 AUD (or an equivalent sum) into the person who referred him. Pepperstone does not offer any bonuses whatsoever. The reason for this is because for them it is of crucial importance to keep their spreads super low.